Eye protection is a given when playing airsoft, but if you're not protecting your teeth, you're asking for a whole host of expensive dental repairs. Traditionally, your options were fairly limited to paintball masks or neoprene lower face protectors, both of which have their own problems with aiming using iron sights and goggle fogging. Mesh masks offer some benefits over their other counterparts, including better ventilation, and with some designs, much better ability to maintain a cheek weld. Obviously, for full eye protection, you will want to supplement mesh masks with a ballistic rated goggle/glasses setup, but for facial protection, mesh can certainly get the job done. This mask, the Matrix Iron Face Striker Gen 4 unit, is a very unique design, as it doesn't just protect the lower face, instead opting for fencing style full face mesh protection. I will discuss all of my observations about this unique system in this review! 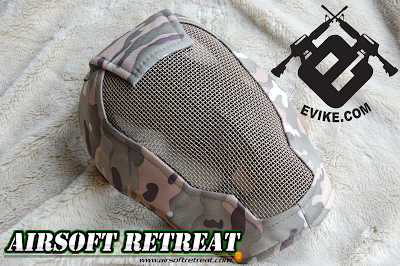 I obtained this mask from Evike, where it is currently available HERE, priced at only $30. It is available in a variety of different colors and patterns, including black, tan, OD, ACU, MARPAT, Woodland, and of course, the “Land camo” being reviewed today. A few days after I ordered it from Evike, it arrived via UPS ground shipping, which is Evike's free shipping option for orders over $100. As mentioned before, this mask has a really unique design, as instead of just covering the lower portion of your face with protective mesh, this one comes with mesh covering your whole face, from forehead to chin, surrounded by thick fabric for additional protection. I can't stress this enough, but you do want to use supplemental eye protection with this system, as I don't recommend using mesh itself for eye protection. Luckily, this is able to fit low profile shooting glasses underneath, full seal goggles over the mesh, or in my case, my prescription glasses, which are fitted with high impact polycarb lenses. The mesh used is woven steel, that is finished with tan paint. You do make some strength sacrifices vs. perforated steel mesh, however, you get a fair amount of flexibility to allow you to bend the mask to fit your face. The mask comes packaged simply in a clear plastic bag with no labels whatsoever. The packaging does a fair job of protecting the mask during shipping, as it arrived without any damage. My first impression upon looking at the mask was that the fabric and mesh both appeared to be of high quality, and that it was actually quite comfortable to wear, even over my glasses. The mask will best be described in three pieces: the “Land camo” material surrounding the mesh, the mesh itself, and the breathable mesh inner fabric. I will describe each of these pieces in this section. The material used on the main body of the mask appears to be a cordura type material, which is flexible, strong, and the coloring applied looks great. The stitching used is a green color, and is single stitching throughout most of the mask. At the top of the mask you will find a reinforced rectangular piece that stretches back to the rear, which houses the elastic attachment straps and buckles that secure the thing to your head. The mesh material used on the face section is, as mentioned before, a steel weave design, which is colored in a tan painted finish. The smallest gap is about 1.5mm, minimizing the ability of errant particles to enter the mask. With repeated projectile impacts, or with high velocity, close range hits, you will likely see some mild dents or paint chipping. Frankly, with steel weave, this can be expected, however, it shouldn't be a safety issue if used with supplemental eye protection. 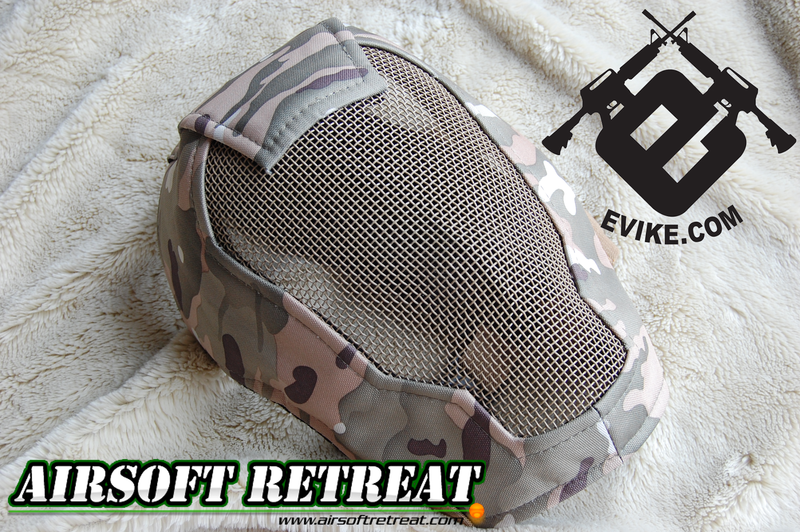 Inside the mask, you will find a different kind of mesh backing the cordura like material surrounding the steel mesh. The inner fabric is a soft, slightly padded material, which is perforated to allow for ventilation and prevent your face from getting too hot. After forming the mask a bit to your face, it is quite comfortable to wear, even for extended periods of time. You adjust it to fit our head by squeezing the metal mesh to fit your facial shape, as well as by adjusting the buckles on the elastic that secure it to your head. Now, how well does it take a hit? Not too bad, although, as mentioned, with high powered guns, you will likely get some denting and paint chipping when hit. To demonstrate this, I shot it point blank with my upgraded Echo 1 ASR, which is shooting 435 FPS with Echo 1 .28g BBs, which is almost 2.5 joules of power. Results are as pictured. So, as mentioned, this works well for 99.9% of the airsoft shots that you'll get hit by, but there is always a possibility of paint chipping and mesh denting with high powered rifles and close ranges. Even for low powered use, I really do recommend using supplementary eye protection, either by using goggles on top of the mask or shooting glasses inside the mask. When looking at this, I wanted something that would look interesting on the field, and offer me protection for my lower face and forehead, without totally fogging up my eye protection. I can run my ballistic lens equipped RX glasses underneath this, with no issues, and I have extra protection from anything getting inside the mask. Overall, I dig this thing, and am happy to throw it on at the field!